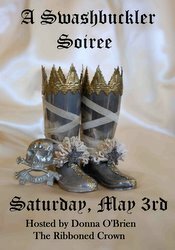 Donna of the Ribboned Crown Blog is hosting a Swashbuckle Soiree this weekend. Have started the party with a little box of treasures. And with that message – I am off to see what other creative things we can get into this weekend. 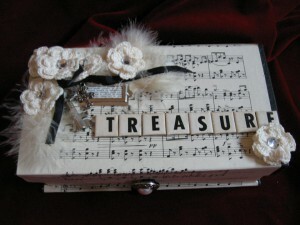 Treasure box covered with music papers and lined with dictionary pages. Often include dictionary definitions in paper projects. Funny that in this era of on line everything, old dictionaries are now a treasure from the past. And always interesting to reflect on what the words might mean to you. 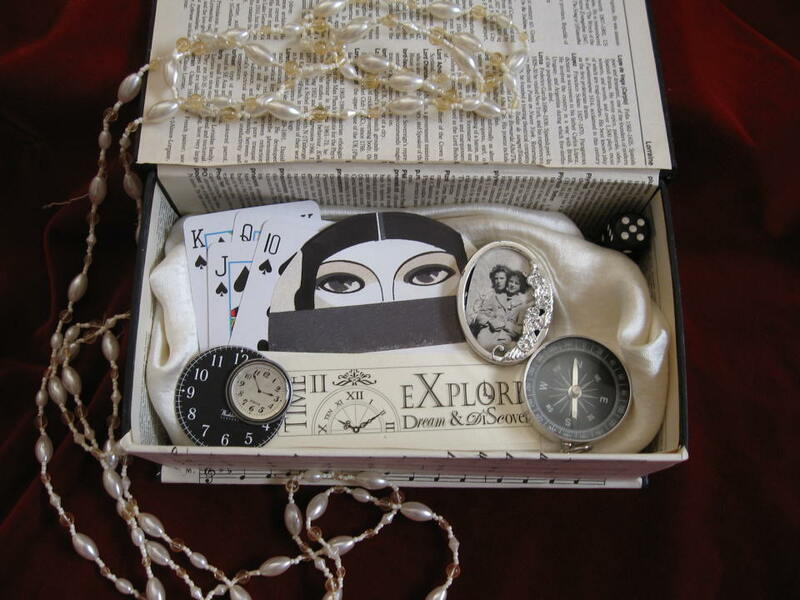 Such a beautiful box Mandy! You always have wonderful things to add to your creations which makes them totally unique. You are really working it here!!! This is a great piece! …a beautiful treasure box filled with beautiful treasures! It’s a beautiful treasure box, with fabulous treats inside! The soiree is in full swing and your treasure box has only added more "ooos and awes"!So happy to have you with us, Pearl. And you have the PERFECT name for the excursion!!<BR/>D. Thanks for sharing your treasure box. It is a treasure for sure! arrrrr…pearls…and..is that a KEY! I see a key in the ribbons…wonder what that key opens…..hmmmm…. treasure….??? Wow, love the treasure box, what a fun project!! I love this! 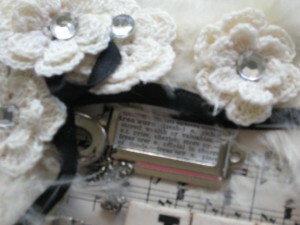 The crocheted flowers and the paper are just stunning. Completely beautiful! Leave a Reply to ShabbyInTheCity Click here to cancel reply.